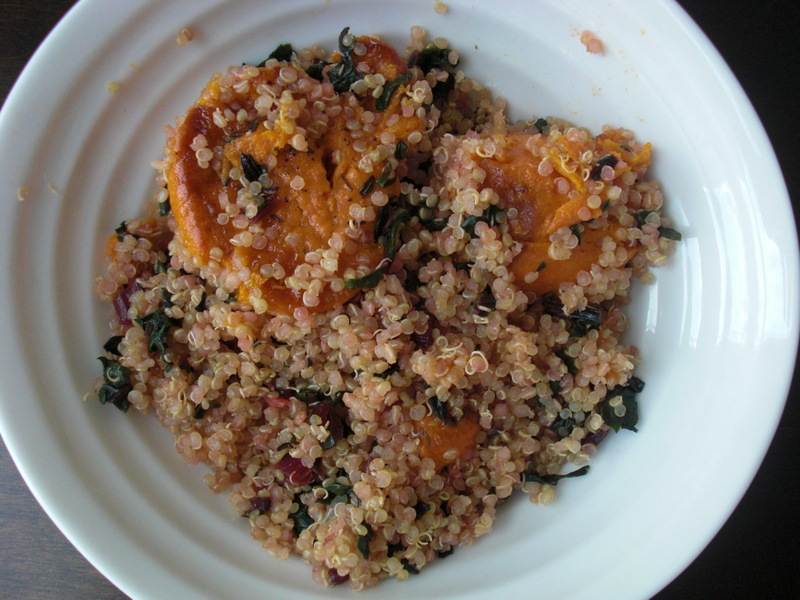 Quinoa with Swiss Chard and Sweet Potato | One Picture, A Million Words. For some inexplicable reason, both my children hate sweet vegetables. Sweet potatoes. Carrots. Parsnips. Every member of the squash family. They can detect the sweetness of these vegetables in any incarnation (curries, soups or mixed vegetable mash) and it really offends their taste buds. But that doesn’t stop me from cooking them every now and then because I love them. To be fair, I keep the offending vegetable in large chunks for easy removal. This dish is an example of how I typically cook grain salads. I cooked the components separately: sweet potatoes were roasted in the oven, quinoa was simmered in a pot and the finely chopped swiss chard was sauteed in another pan. When done, I assembled everything in one large serving dish and seasoned with the usual suspects like salt, pepper, lemon juice and olive oil. I find that cooking each ingredient separately preserves and highlights its flavour in a tossed salad. Sure, there are more dishes to wash after the meal, but that is what the dishwasher is for! Next > To the Park We Go!